A deceptively spacious extended and improved three double bedroom detached bungalow in a quiet corner location within walking distance of St Lawrence Primary School and Hurstpierpoint village High Street. On entering the property, the outer front door leads to an inner hallway which has a door to the garage, plumbing for the washing machine, window to the side and tiled flooring. The inner front door leads to the main hallway which has wood laminate flooring, two good sized coats cupboards, airing cupboard, doors to all rooms and a feature high Velux window creating a lovely sense of space and light. There is a hatch to the insulated and part boarded loft space. The sitting room is at the front of the property, has a bay window, wood laminate flooring and a feature fireplace. The kitchen/dining room (measurement) opens to the garden having sliding patio doors leading to the patio area, a range of cream coloured wall and base units with contrasting solid oak work surfaces, a 'John Lewis' double oven and 4-ring electric induction hob with hood over, butler sink, integrated dishwasher and fridge/freezer, breakfast bar with space for two stools, walk-in larder, tiled floor and window to the side. The master bedroom which has a large window overlooking the garden, has built-in cupboards and an ensuite shower room. 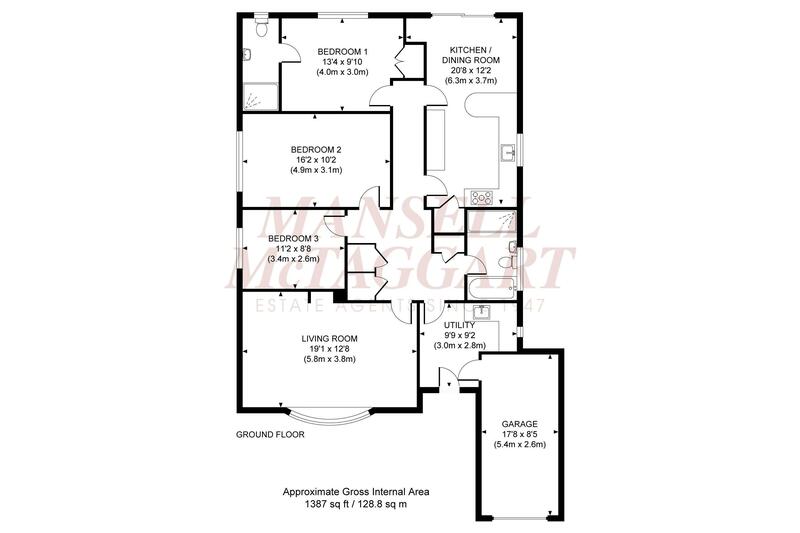 There are two further double bedrooms both with wood laminate flooring. The refitted family bathroom (2019) has a white suite, oversized shower cubicle, bath, WC and tiled flooring. Outside, to the front the driveway offers parking for two cars and can accommodate a caravan or boat if needed. The garage has an up and over door, power and light, and could be part converted to add an additional reception room/bedroom if required (STANC's). To the rear the lovely fully enclosed 36’ x 38’ garden which has steps up to the house, is laid mainly to lawn and has shrubs, borders and trees, a summerhouse, shed, side gate to the front of the property and attractive dwarf wall. Other benefits include uPVC double glazing throughout and gas central heating. In addition, there are privately owned solar panels which generate on average an annual income of £700 (tbc) and have an i-boost system. These panels are transferrable to new owners. Deceptively spacious detached bungalow in a quiet corner location. LOCATION The property lies just off the Cuckfield Road within easy walking distance of Hurstpierpoint village High Street which offers most daily needs from its traditional range of shops and stores, various restaurants and public houses. The village also benefits from several churches, primary school, library and health centre. For a more comprehensive range of shops Hassocks, Burgess Hill and Haywards Heath are all within easy reach and Brighton is about 11 miles to the South. STATION The nearest mainline railway station is at Hassocks which is about two and a half miles to the East and provides fast, frequent services to London (Victoria/London Bridge 55 minutes), Gatwick International Airport and the South Coast (Brighton 10 minutes). DIRECTIONS From our offices in Keymer Road, Hassocks, proceed West passing under the railway bridge and onto the traffic lights (Stonepound Crossroads). Proceed straight over into Hurst Road which then becomes Wickham Hill and then Hurstpierpoint High Street. Passing through Hurstpierpoint High Street to the roundabout turn right into Cuckfield Road, take the second turning on the right into Marchants Road then first left into Wilderness Road. An excellent detached three double bedroom family home, within walking distance of the village High Street, local schools and shops.